This planning the food production assignment we have explore food production process, special requirement. Chop the bacon. Slice the anchovies. Peel and crush the garlic. Dice the bread. Fry the bacon and garlic in the olive oil, remove. Add the diced bread and fry for croutons. Place the heat leaves onto chilled plates. Tear the remaining leaves into bite-size pieces, pat dry and place into a bowl. Pour the dressing over and combine until lightly coated. 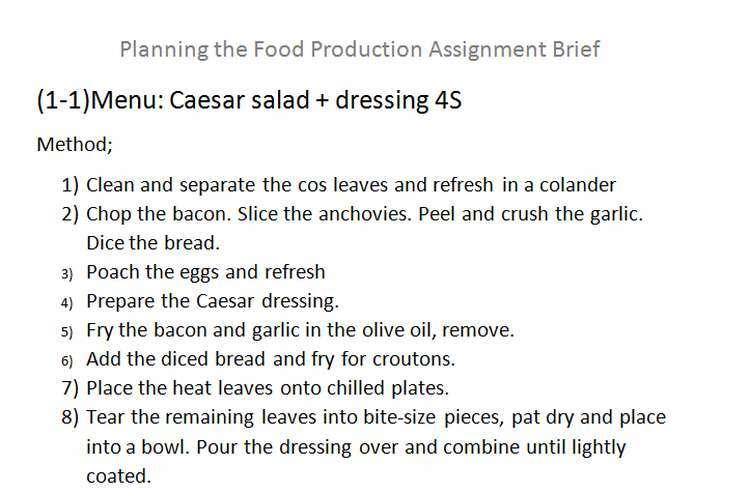 Add some fried croutons, bacon and anchovy fillets. Toss through and place onto the plates. Finish with the remaining bacon, Parmesan, croutons, poached egg and anchovy fillets. Separate the eggs and whisk the yolks with the garlic, anchovy, parmesan, Worcestershire sauce, mustard, lemon juice and vinegar. 4. Smash the anchovy.Add the mustard in there and smash. 5. Add the taragon vinegar into (4) and mix. 7. Remove the potetoes from water and add into the pan. 9. squeeze the cooked galic and mix with (5). 11. Slice the cooked shallot. 12. cut the cooked potatoes into 3 pieces. 14. oil the pan, fly the potetoes, shallots, tomatoes, oregano, rosemary, and sauce. 15. place on the dish, garnish with capeburries and oregano. 1. cut the eggplant and zucchine and fry with oil and garlic, then add the capsicum. 2. chop the basil and oregano and mix the oil. 3. add sundried tomato into the (2). 4. Mix the cooked vegs and (3). Slice them and rest in the fridge. 5. Place on the dish. 5) Heat the butter in a pan. Add the onion and saute. Add the spinach and seasoning, saute briefly and drain. 10) Bake in the oven at 140 dgrees for 20-30 mins until the egg custard has set, remove from the mould. 11) Place a quiche onto a plate and garnish as desired. 5) Place the eggs in a saucepan of water and bring to the boil. Cook for 8 mins then cool in an ice bath. Peel the eggs, separate the whites and yolks and dice both. 7) Combine the egg yolks, French shallots and capsicum. 8) Place a teaspoon quenelle of the beef mixture into a Chinese spoon, then topc with some of the yolk mixture. Garnish with a slice of cornichon. 2) French the rack and trim off any excess fat(yellow). Cut the shallow cut on the surface. 3) Heat the oil in a pan. Season the rack and seal it on all sides in the hot oil. 4) Separate the egg. Mix the half of yolk with the mustard and brush over the rack. 5) Chop the mint leaves and melt the butter. Combine with the breadcrumbs and half-yolk. Coat the top and sides of the rack. To stop the bones from browning, cover in foil. 6) WPRW the carrots, onion, leek and seeded tomato and chop fpr mirepoix. 7) Roast the lamb rack in the oven at 180 degrees for 10 mins until meat is medium rare(50-55). Rest for 5 mins. 8) Brow the lamb bones/trim and mirepoix, remove any fat and deglaze the pan with the stock. Add the honey and rosemary and reduce. Strain. 9) Slice the rack in half and place on the pre-warm plate with jus and garnish as desired. 1. Remove the thick sinew from the beef. Truss the strip ion and season. 2. WPRW the carrots. Wash the celery and leek and peel the onion. Cut the onions, carrots, celery and leek into mirepoix. 3. Peel and dice the button onion. 5. Roast in the oven at 180 degrees for 45 mins per kg to achieve mediumrare beef. Use a meat thermometer to gauge the degree of doneness. 6. Remove the fat from the cooking liquid and add the stock to draw a jus. 7. Add the jus, which is made from the cookingliquids with the beef stock added and simeer. Mount with cold butter if desired. 8. Slice the beef. Place the beef onto a pre-warmed plate and spoon the sauce over. Peel and chop the garlic. Chop the parsley. Pre-heat the deep fryer to 160 degrees. Cut a pocket into the side of chicken breasts and insert the butter. Envelop the butter in the chicken, wrap in plastic wrap and refrigerate to set. Fraw the chicken through flour, egg, breadcrumbs, making sure it is evenly covered and the butter filling is not exposed. You may need to crumb it twice. Place the chicken into the deep fryer at 160 degrees for -15 mins, depending on the thickness of the chicken. Cut the chicken in half to release the aromas, Place the chicken onto a pre-warmed plate and garnish as desired. 1) Season the barramundi with celery salt and pepper. 3) Prepare the funnel cream. 4) Heat the mustard seed oil in a pan. Add the barramundi and fry for -8 mins.Turn over and cook for a further mins. 5) Blanch the spinach and parsley, then drain and refresh in iced water. Place into a blander with the cream, horseradish and 1/3 of the fennel cream and blend until smooth. 6) Spray the tomatoes with cooking oil and place under a hot grill or roast in the oven at 180 degrees. Cook for -2 mins, until the skin splits. 7) Warm up the remaining fennel cream. 8) Place a spoon of spinach mixture in the centre of each plate and top with the barramundi and tomatoes. 1) Preparer the sweet paste. Line a 20 cm flan ring, cut off the excess and blind bake the shell. 2) Zest and juice the lemon. Boil the water with the sugar, lemon juice and zest for -1min. 4) Separate the eggs and retain the whites. Mix the yolks with the butter, adding one at a time. 5) Slowly add the diluted cornflour to the sugar mixture while whisking. Then add the butter and yolks mixture to the pot. Whisk through and pour the curd into the flan case. 6) Smooth out the top and place in the oven at 150 degrees for 5 mins. Cool to room temperature. 7) Whisk the egg whites ¾ stiff. Incorporate the sugar until firm peaks are formed. 8) Pipe the mixture onto the curd and glaze with a blow torch or under a salamander to set the meringue. 1. Prepare the mould. Oil spray, set the baking papper, make thbottomu by allminum. 2. mix with cocoa powder and oil. 3. double boil the choc. After melt, mix with cocoa oil. keep warm. 4. separate the egg white and yolk. 5. egg yolk and half sugar and use mixer. 6. Mix the egg white and add slowly the sugar. 7. Add the choc mixture into the yolk mixture. 8. Then add the egg white mixture into the (7) and hold. 9. 170 degree, 30 mins- 40 mins. 1. Use the cold bowl. Put the cream. 2. Sift the icing sugar. 3. Whip the cream to a very soft peak. 4. add the icing sugar and vanilla essence and whip to the desired consistency. 1. Double boil the choc and cream. Don't mix. 2. after heat up and melt, Mix and keep warm. 1) Shift the flour. Zest the orange. Beat the eggs. 2) Melt the butter to noisette stage then add the oil. 3) Add the orange zest to the sifted flour then the sugar, noisette butter and eggs. Gradually add the milk and combine. 4) Heat butter in a crepe pan and pour an even thin layer of mixture into the pan by tilting it. 5) Cook briefly on each side, until lightly browned then turn out on to a tray. Separate the eggs and put aside the whites. Cream the egg yolks and sugar. Prepare a clean, sanitised container with lid and place into the freezer to chill for storing the finished ice cream. Bring the milk, cream, vanilla bean and seeds to the boil. Remove from the heat. Gradually whisk the milk into the egg yolk mixture. Return to the heat and thicken until it coats the back of the spoon. Do not boil the sauce or the egg yolks will solidify. Cool over ice, then pour into an ice cream machine and churn to the desired consistency. Pour into the prepared freezer-safe container and freeze Serve in a frosted dish.